Soak in water the chuño and mote during the night before preparing the dish. Cook the mote in a pot of water. When necessary, add water to prevent the mote from drying (be careful, if the mote starts sticking and burning in the bottom of the pan, the dish is lost!). 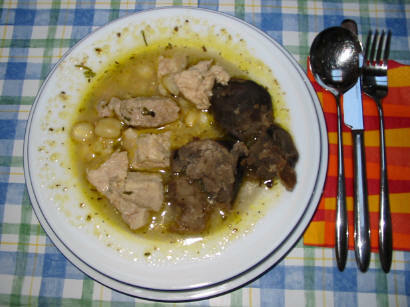 In another pan, cook the chuño or potatoes. Cut the pork into pieces. Heat some oil in a large saucepan, add and cook the onion until golden on a slow heat. Then add chopped garlic, cumin, oregano, pepper, salt and aji. 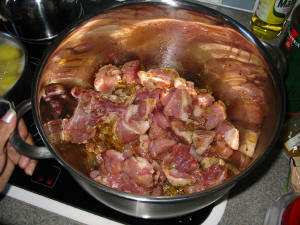 Mix with the pork and add 5 cups of water. Cook for about 2 hours until the meat is tender and firm. Finish the preparation by adding the breadcrumbs, then serve in bowls with the mote and chuño or potatoes. Garnish the dish with chopped parsley.